Recently purchased a 2 mg3 tripods for my semi auto belt feds. 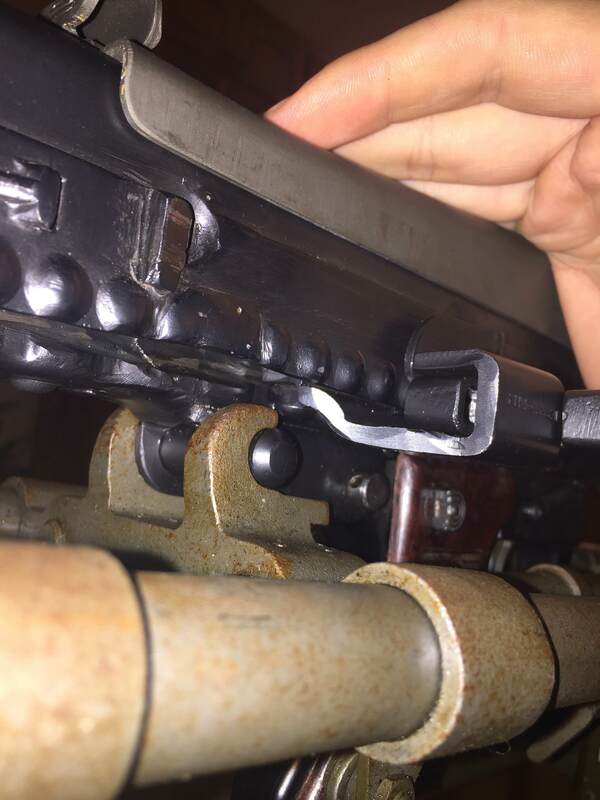 Went to install my mg42 reweld and I am encountering some problems on both tripods. First the gun installs into the hooks & front catch with no problem but when I try to pull the cocking handle back the rivets on the cocking handle hit the mounting hooks on the tripod which prohibit me from pulling the handle all the way back to load. 2nd when trying to mount the gun into the tripod it seems that my trigger is too far forward for the tripod trigger mechanism. Is there some trick for getting the trigger & tripod trigger to fit together? Some sort of adjustment I haven’t figured out yet? Wanted to get some feedback before I start any grinding/milling. Some guns fit the tripods, some don't. Wiselite receivers which are longer most certainly don't fit right. Your solution will vary depending on what you have and what the problem is. Semi 42's have variable receiver lengths, depending on who made it and how carefully it was kept to original specs. The MG42 semi, what trigger setup does it have? If the standard ar-15 one then a little bending to the mg3 lafetter trigger metal might be needed. Not much but. Sorry no thoughts on the rivet hitting problem. A pic might help out a lot here. Good Luck and let us know whats working post a pic and we can try to help out a little more. Its a standard BRP AR 15 trigger setup. Didn't know if there was a trick to it or not and didn't want to start grinding/bending on it until I reached out to people who actually have & use these already. I will take some pictures this weekend to better illustrate my cocking handle problem. I will get back to yall this Saturday. On a side note has anyone ever attempted to retrofit a crank system to the tripod trigger mechanism? Seems like that something that would be possible. Believe me set the trigger lever straight out towards you and slap it down fast and it will go thru a 50 rd belt so fast you will not think about crank fire unless you have lots of ammo. Been there done that with the slap of the trigger bar before. Pictures of the problem areas as requested (Sorry if they are huge). The 42 is a reweld build that was a combo of Robert Naess & Phillip Stouts work. MG3 Tripods are both DISA mfg. First picture is the cocking handle problem. As you can see the cocking handle rivets hit the top of the tripod hooks. Should I grind the tripod hook or mill the rivet heads? Second picture is that of the trigger mechanism. The tripod trigger is way too far back to work. 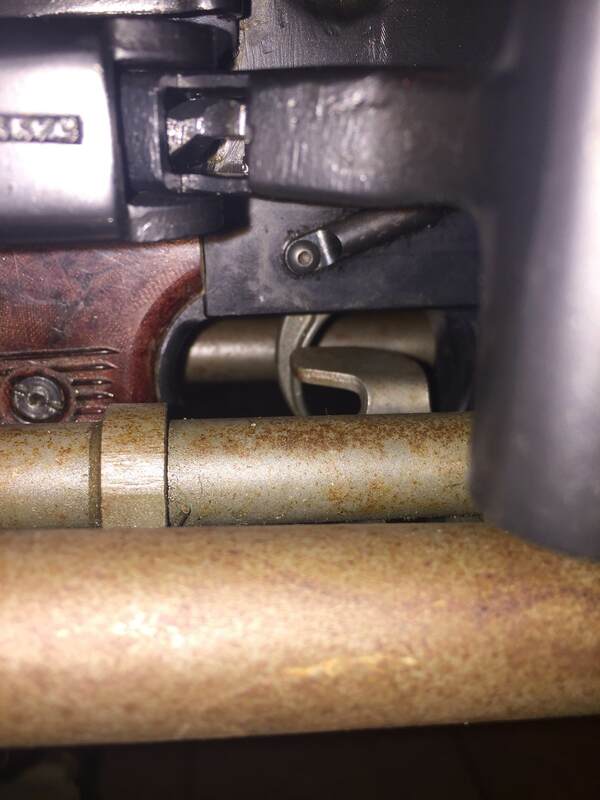 Is there an adjustment or is it just bending/fitting the trigger mechanism?